Several Craft Nectar readers have expressed an interest in learning more about the cork walls shown in my interview on Reclaiming the Home. So here’s the background and some tips about installing your own cork wall. Before starting FunQuilts I worked at a 300-person architecture firm in downtown Chicago. The best thing I got from that job, other than the realization that I never, ever wanted to work for a 300-person architecture firm again, was the idea for the cork wall that’s in our kitchen. On each corner of the 20th and 21st floors of that architecture firm was a coffee area with an adjacent cork wall for displaying architectural drawings with the exact light fixtures we have on our wall, which as I recall were assembled by some guy in his garage in Seattle. The lighting is really critical I think or else the whole thing is in shadow. The cork walls at the architecture firm were all painted various colors but both Bill and I love the natural cork color.We have this floor to ceiling cork wall in our kitchen, a counter to ceiling cork wall in the studio and a cork band along one wall above our desks in the office. Cork has followed us around. Bill grew up with cork flooring in his family’s kitchen, designed by his father, an architect. Our first apartment after getting married was in a Mies van de Rohe apartment building in Chicago, which explains why we have a cat named Mies van der Kitty. As a note to you architecture lovers, I would never have named the cat Mies had I known that we would settle in Oak Park, the home of Frank Lloyd Wright. It just seems wrong to be looking out the back door at all of these Arts and Crafts bungalows calling for our cat named after the father of Modernism. “Mies? Come on in Mies.” I say to him when I’m trying to lure him off the comfy chair on our back porch where he and his sister survey their domain. Anyway, the flooring in our Mies apartment was sealed cork. The cork on the wall was actually purchased from a hardwood floor installation company. Here’s a link to an online source. 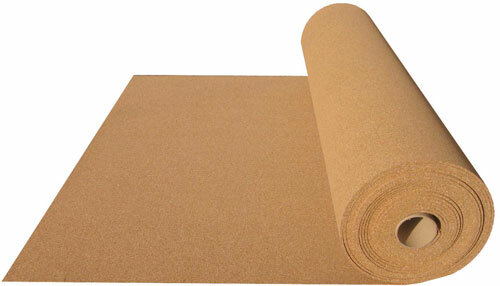 It’s the underlayment used for installing hardwood floors. It came in rolls and we got a special cork adhesive at Home Depot to adhere it to the wall. Installing the cork wall in the kitchen yielded one of the greatest lines ever uttered in our marriage. There we were with the first piece of cork cut to the exact wall dimensions with cut outs for the light fixtures. The light fixtures had been hard-wired before we put up the cork. We’re both standing on ladders on either side of the sheet of heavy cork and we’re about to adhere it to the wall before the adhesive dries. There’s no going back at this point. Then Bill says to me in the most gentle and diplomatic voice, “However this ends up looking, I think it’s important that we both recognize that we’re doing our best to get it right.” We both knew that if we didn’t get those edges perfectly abutted it would drive us crazy for years to come. Happily, we got it up perfectly and incurred no damage to our marriage. We rotate the stuff on the wall regularly because even though it faces north and gets no direct sun on it, the ambient light does gradually fade the color of the cork if you leave things in the same place for months at a time. The cork is about 1/4″ thick so it holds push pins easily. As we put up there every thing we need or want to remember I have to do a cork wall audit sometimes before parties. Once I found a single male dinner guest, who was waiting for me to pour him another glass of wine, staring at the mammogram script from my doctor for an upcoming appointment. It had the breast diagram on it and he was staring at it for way too long. I’m guessing this was a curiosity for him as I doubt he had ever seen a mammogram order before but I swear he was looking at my breasts for the rest of the night in an odd sort of way. 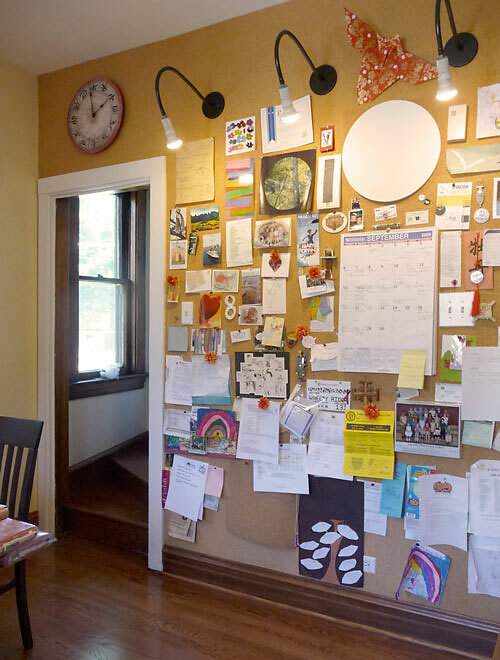 Anyway, realize that if you put up a cork wall, people will want to look at every single thing on it, so be forewarned! Also beware that if you have cats, they will think you have put up the greatest scratching post in history just for them. We handled that by tacking an extra sheet of cork on top of the cork adhered to the wall and making sure that the cork within paw’s reach is covered with papers of some sort to deter destructive scratching. No matter how many other scratching posts we give those cats, they seem to like the softness of the cork. Plan accordingly. very cool. i had no idea cork could come on a roll like that. thanks for sharing the photos. Looks great, I’m excited to see another one of these. I did a full wall in my house a few years ago. I agree it’s a scary moment when your wall is covered in industrial glue and you are weilding a huge piece of cork! Good tip on moving things around. I need to do that more often. 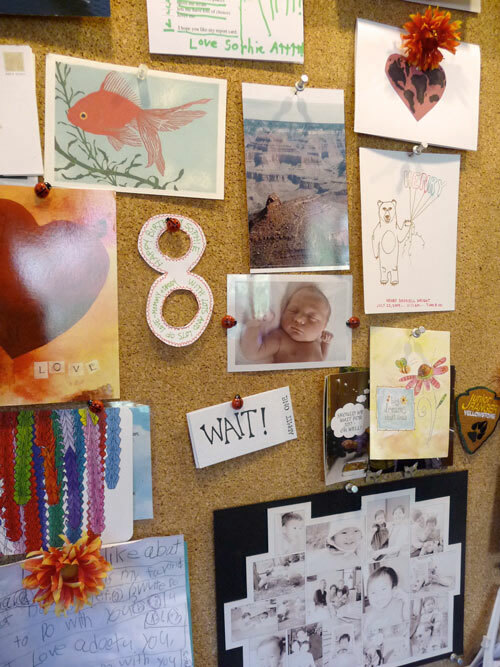 It must be the teacher in me, but wall to wall notice boards strike me as the only way to keep track of a family’s worth of photos, unpaid bills, finger paintings, fantasy quilts, schedules, visual timetables, blah blah…..I mean, a refrigerator is only so big, right? My smallest is four now, so the tide line has crept lower- nothing a toddler loves so much as pulling stuff off the fridge! We are about to re-do our 2 year old sons room. I want to add a cork wall and psyched I found you on line when searching in google. Thank you for all the great tips. There is nothing under the cork? just the adhesive? do you remember the adhesive you used from home depot? Also since we are reconstructing the walls would you suggest putting crown molding over the cork so it looks clean? Huge thanks and I will email you with the photo of what it looks like. Jess–I’m glad you found my post helpful. I don’t remember the exact cork adhesive brand but anything that says “cork adhesive” should be fine. Paneling adhesive might also work. What you want to think about is the set-up time. You don’t want it to be too fast or you won’t be able to get the cork in place in time. Under the cork was regular drywall and the adhesive and that’s it. We put trim along the bottom so the vacuum cleaner wouldn’t be bumping against it but we cut a clean edge against the ceiling so it butts up perfectly against the ceiling. If you’re worried about not cutting straight, certainly trim can cover up a myriad of problems. Although you didn’t ask I feel responsible since you mentioned that it was for a 2-yr-old’s room to remind you to be super careful with whatever you use to pin into the cork. When our daughter was that age we removed every pin/tack from the bottom 4 feet of the cork because even though she did not put things in her mouth, visiting playmates would. They’d pull down drawings and the tacks would come down with them and they’d pull the tacks out so they could put them in their mouths. Scared the daylights out of me! Good luck! how many rolls did it take you to cover that wall? thank you for the tips, looks great! We put that cork wall up in 1998 so the details are fading from memory but as I recall we bought one continuous piece that was custom cut for the number of inches we needed. At the flooring dealer we just told them the length we needed and they unrolled that amount and cut it for us. Our ceilings are higher than normal so we calculated the number of inches once we knew what the width was. I think there are three sections along that wall and we took great care to get those seams really tight. Thanks for the great post! I’m thinking of lining the walls of our toilet room (which is very small) with cork. The plaster on the walls is old en is crumbling in some places. Do you think the cork will keep everything in place, or will it do the reverse and pull everything down? The general thinking about renovation is never put good over bad. I would remove the crumbling plaster and put up drywall before you attach the cork. I decided this would be a fantastic idea for my apartment earlier this week and have been searching around to find a good adhesive that won’t leave me crying in frustration when I inevitably move in several years and have to clean up after myself. I know I should probably opt for paneling but would really prefer to apply directly to the wall. Any thoughts/experience? Contact cement and cork adhesive seem pretty permanent, though a water-based contact cement might not be too bad to remove..? Semi-permanent is always such a fine line. I would absolutely NOT install a cork wall in a home you don’t own. If you do, you will end up putting a layer of drywall over it as the adhesive will not come off. The way to do it is to fabricate a dummy wall of plywood that screws into the permanent wall and then laminate the dummy wall with cork. You could also install it in panels. You will not see the seams if you’re careful and you won’t see them once you have things pinned up on top of them. hi there, I was wondering if you used 1/2 inch or 1/4 inch underlayment?? I’m just not sure how much cork to get for a wall? would it be worth getting more than I need? how messy/easy is it to cut cork, anyone know? Adam – the supplier doesn’t sell colored cork because it’s very easy to paint! We prefer the natural color of cork because what we put on it was very colorful and having it neutral allowed us to change up the color by what we put on it. Cork is extremely easy to cut with a box cutter/utility cutter, a 48″ drywall t-square and either a cutting mat or a large flattened box. Measure the wall height and width and figure out the length you need based on the width of the cork. If your blade is very sharp it’s not messy at all. This looks like exactly what I want to help dampen sound between 2 rooms. Because I rent the space and have never worked with cork, would it be an issue to decoratively nail the cork up versus using the adhesive? I also like the mounting on plywood and attaching that directly to the wall versus adhesive, but that may not be doable for my space either. Also curious if the texture/make up of cork underlayment is suitable for wall hanging or if it’s too rough? Haven’t been able to find that answer in my brief research yet.